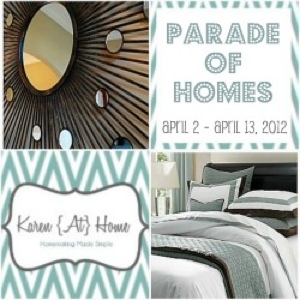 The Suburban Style Life: Parade of Homes ~ Linky Party!!! Parade of Homes ~ Linky Party!!! TGIF Friends! Well, we made it to the end of the Parade of Homes Tour. I must admit, I am a bit dissappointed. What an amazing group of tours we had here!! Thanks to all of my guest bloggers who participated in the tour. I really appreciate you taking the time to put together such amazing posts. I know it takes time and effort to clean and stage your home, take the pictures, and then upload them into a blog post. I really appreciate it!!! Now it's your turn! Below is a linky party all set up for you to enter a link to your home or room that you are proud of. I can't wait to see your beautiful homes!!! How fun! Thanks for hosting this, Karen! I'm also friends with Beth @ Unskinny Boppy and Jenna from The Hamlett Daily Dose, and now I'm a reader of your blog! Can't wait to see all the other homes! This has been fun Karen to have a peek into everyone's homes. Love the inspiration!! What a great linky party! Thanks for doing this Karen! What a fun 2 weeks! What a fun idea! I'm going to have to go back and check them all out!